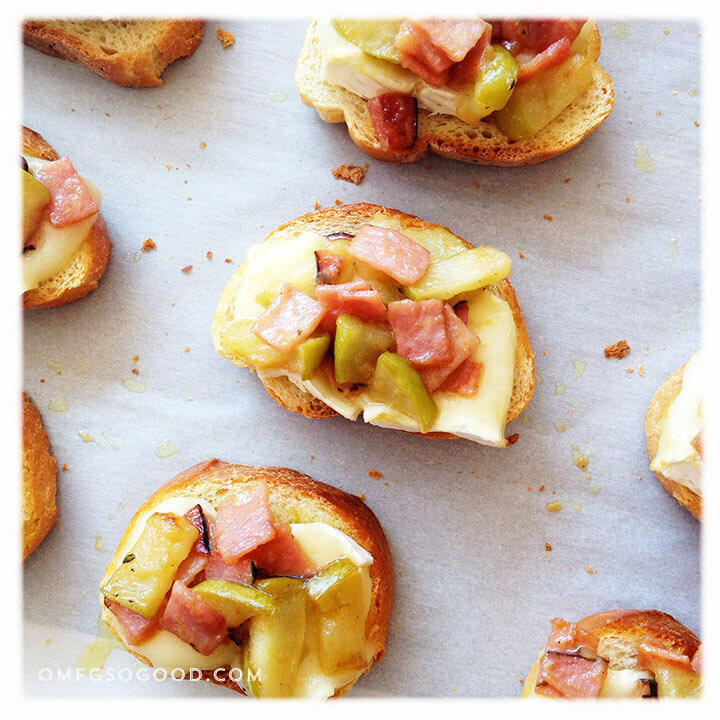 ham apple & brie crostini | omfg. so good. Sometimes I just don’t feel like cooking. There, I said it. It’s times like these that I’m grateful for easy meal options like crostini. Crostini, and friendly neighbors who graciously brought us freshly picked apples from their recent northward Arizona apple orchard excursion. Thank you, friends. 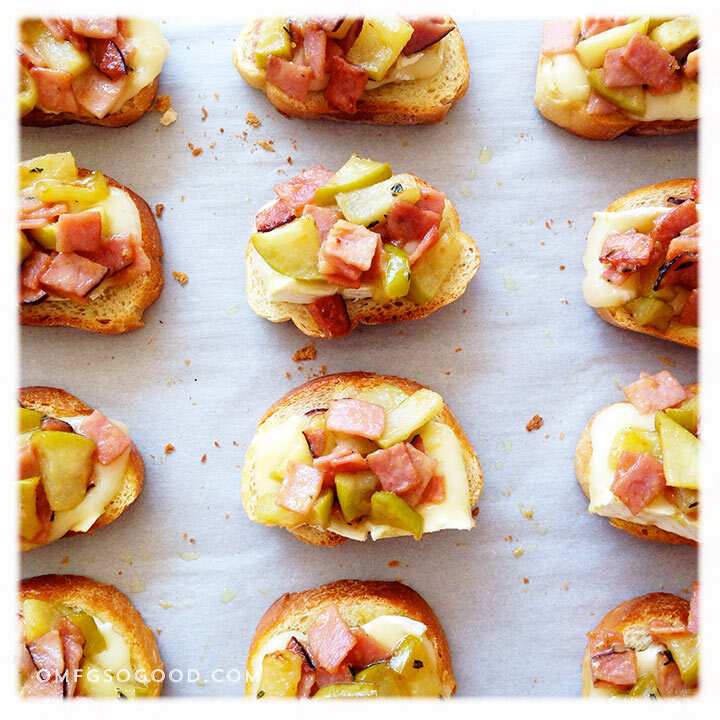 Now in return I’ll share this recipe for super easy, super delicious ham, apple and creamy brie toasts. They’re pretty much like little open happy face sandwiches, just begging you to take a bite. And since they take a mere 15 minutes to prepare (give or take a few), they’re perfect for a busy weeknight (or lazy weekend) meal. Preheat the oven to 350 degrees. Line a sheet pan with parchment paper and arrange the sliced baguette in a single layer. Brush each slice evenly with melted butter, sprinkle lightly with salt, then toast in the preheated oven for 10 – 15 minutes, or until they’re golden brown and toasty. Remove the toasts from the oven and arrange a slice of brie on each. In a large saute pan, over medium heat, combine the chopped ham, apples, dijon and honey, and stir to evenly coat. Saute until the apples soften, then toss in the thyme and stir to combine. Spoon a bit of the ham and apple topping on top of each slice of brie. Now, all that’s left to do is to throw elbows for the first bite. You’re not alone. Sometimes being in the kitchen too long all week burns you out. 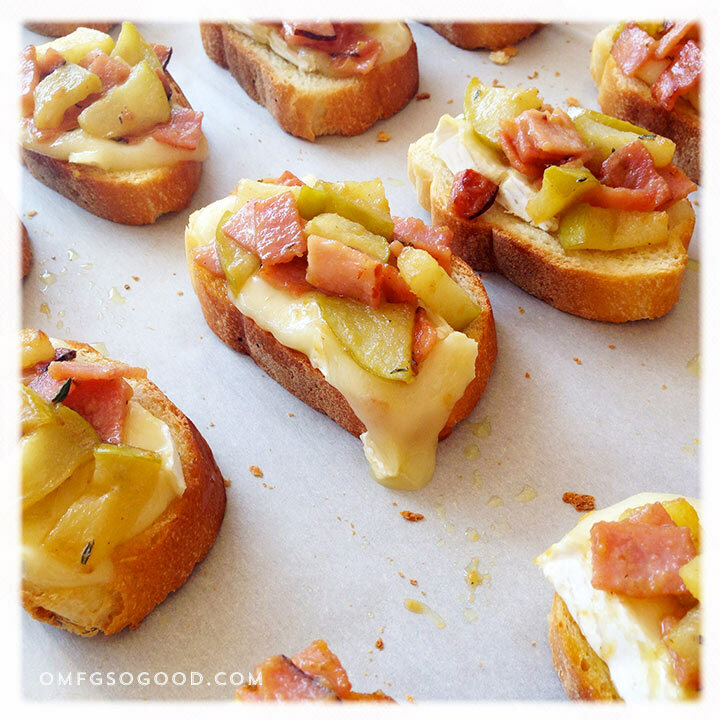 These crostini look wonderful!